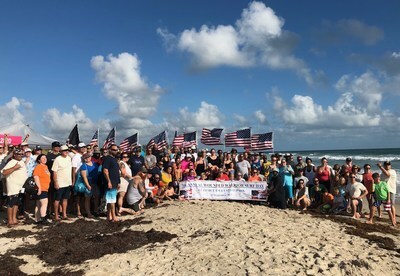 FORT PIERCE, Fla., Nov. 2, 2018 /PRNewswire/ -- Warriors and families bonded with each other at Fort Pierce Inlet State Park during a surf day organized by Wounded Warrior Project® (WWP). To welcome the warriors, a crowd lined the entrance to the beach, displayed the color guard, played bag pipes, and cheered for the warriors. Eddie O'Neal, a retired Army forward observer, first tried surfing with WWP in New York. "I know if it's organized by Wounded Warrior Project, it's going to be something good," Eddie said. "For the event in New York in 2012, we gathered at a firehouse in Brooklyn, and they transported us on firetrucks to Rockway Beach, Queens." Eddie continued practicing his surfing skills through WWP in Virginia Beach, and even participated in a surfing tournament. In 2013, he moved to Florida and stayed close to the water and to WWP. "I enjoy the surfing and also the camaraderie," Eddie said. "You can talk to other vets who have shared your experiences, including combat experience. We relate on different levels. "Surfing is a way to be in harmony with nature," Eddie said. "You're also there with people who care for you, and you know they care because they put their lives on the line for you." For first-time surfer Karen Leal, the experience was full of life lessons. "I not only connected with nature but learned patience as I waited for the right wave," said Karen, a retired Army logistics service specialist. "When you get up and fall, you get yourself back up and keep trying until you have reached your purpose, which is to ride that wave." Karen attended the surf day with her husband and three daughters. "My family had a chance to see veteran appreciation and were blown away by all the love," Karen said. "My daughters were very proud of me and even thanked me for my service." "I enjoyed connecting with other veterans. I thank Wounded Warrior Project for all that they do – words cannot express my gratitude," Karen added. To learn more about how WWP helps warriors achieve their highest ambitions, visit https://www.woundedwarriorproject.org/programs/alumni.